STK or SterlingTek is a company with the most unlikely of beginnings out there. It all started when its founder Chris Chenault began retailing jewelry on eBay, back in 1999. The idea for the company grew out of discontent with the life and overall performance of his AA batteries, which prevented him from taking all the photos he wanted. After realizing other people must have the same kind of problem, he focused his attention on AC adapters. He founded a factory to produce Olympus AC adapters, started receiving numerous offers from renowned companies, and the rest is history. The enterprise quickly amassed over 750,000 users all over the world. You might wonder how this connects to our STK Paternity Test review, though. Well, apart from digital camera adapters, laptop batteries, and chargers, STK also retails its own paternity DNA test. You might also have some reservations about this unusual combo, so our review will paint an objective picture of the STK Paternity Test Kit and put it under heavy scrutiny. 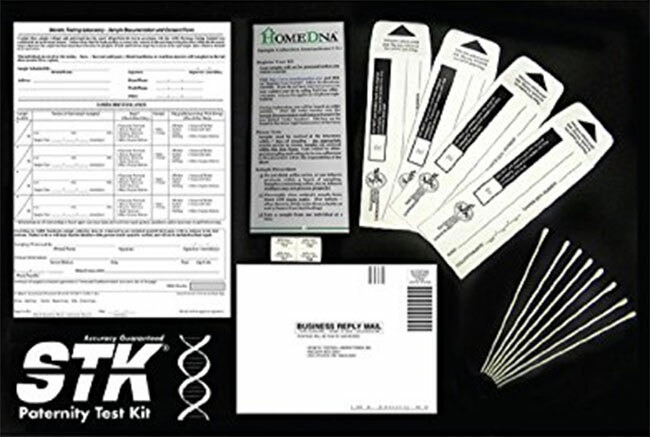 Online order – STK conducts its online purchases through Amazon, so even if you order the DNA testing kit through its website, you will be redirected there. 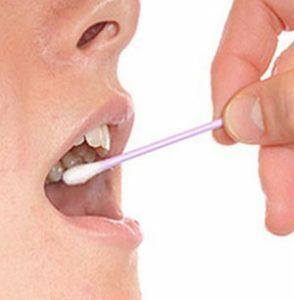 Sample Collection – The kit utilizes buccal swabs for the DNA sample collection process. The procedure takes minutes, is completely painless, and can be used for all ages, including newborns. Mailing the sample back – After you’ve collected your DNA specimen, you’ll have to send it back to the STK lab, which is located in the US, for further processing. The kit comes with a pre-paid return mailer, so you don’t have to worry about any additional shipping costs. Your DNA sample will be sequenced mere hours upon arrival. Accessing the results – Your final report will be complete around 3-5 days after STK receives the sample. The results can be accessed online. You can also print them out or request a full-color copy delivered to you by mail. SterlingTEK is definitely a unique company with an eccentric portfolio ranging from laptop batteries to paternity DNA testing. Having said that, quality is quality, so we don’t mind the eccentricity as long as the company meets our performance criteria. The STK Paternity Test Kit is an at-home paternity DNA test. It is designed to satisfy your own curiosity concerning a potential paternal biological relationship. The price of the test is 99.99$. The company offers a 50$ credit in case you need a court-viable proof of paternity, but it doesn’t provide this option, which is, however, not stated in the official disclaimer. The STK Paternity Test inspects 16 genetic markers while processing your DNA sample. This is the middle amount of DNA loci checked; we’ve seen companies go both lower and higher than this number. Genetic markers compared within the genomes of the child and the suspected father are highly relevant since they closely relate to the overall accuracy of the test. Having said that, this is a very respectable number for the price tag. As with all modern paternity tests, the inclusion will have a 99.99% probability of accuracy while exclusion raises that percentage to 100. STK offers very quick turnaround times. 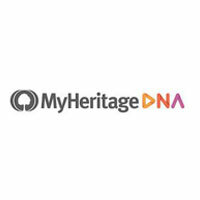 You get the test results usually 3-5 business days from the moment the company has received your DNA sample. You can inspect your results online and print out a copy. If you’re having certain doubts or additional questions, you can always contact STK for a professional interpretation of your results. This is a feature unique to this company. We’ve seen providers offering pre-test consultations and written results reviews, but this is rather uncommon. As far as data-transfer security goes, we’ve already mentioned in this STK Paternity Test Kit review that it handles its orders through Amazon, which means your payment details are completely secure, following the elaborate rulebook of Amazon data security. The payment and shipping are processed through Amazon, so its rules will apply to all STK products, including the paternity test. The said test is available in the US and all orders from the 50 states are eligible for free shipping. International shipping is where things get a bit confusing. The STK Paternity Test is clearly not available worldwide, but there are certain countries where it can be shipped, according to Amazon. If you’re ordering abroad, the first step is to check whether your country is eligible for shipping or not. Amazon also offers one-day shipping and free two-day shipping with Amazon Prime. If the test is in stock, your shipment should leave the warehouse 5-8 days after the order is received. STK is definitely an uncommon mix of relationship DNA testing and electronic equipment. This could potentially lead people to dismiss its test without even giving it the benefit of the doubt. After you do some research on the topic, you’ll discover a pretty impressive paternity test with numerous relevant certifications. Is it the best paternity test out there? Not by a long shot, but it is still surprisingly decent for a price that is beyond budget-friendly. It doesn’t come with all the fancy features some other companies offer, but it provides the essentials, which is pretty much all you need. Our ratings are the result of an objective and independent evaluation of STK Paternity Test Kit, generating the final rating that reflects the overall quality of the company. Ratings may change as the service changes. 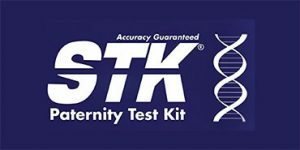 STK Paternity Test Kit user rating based on 4 user reviews. The test gave me all the info I needed, but be sure to write down your confirmation number, or you'll wait an eternity like I did. I didn't realize there's an extra fee if you want a copy of the resutls delivered to your home! My disappointment with the results aside, the test did exactly what it's supposed to do. We found 0 verified STK Paternity Test Kit discounts for April, 2019. There are no STK Paternity Test Kit coupons or discounts right now.